A true account of the deadliest animal of all time and the hunter on its trail.Nepal, c. 1900: The single deadliest animal in recorded history began stalking humans, moving like a phantom through the lush foothills of the Himalayas.As the death toll reached an astonishing 436 lives, a young local hunter was dispatched to stop the now-legendary man-eater before it struck again.At the turn of the twentieth century as British rule of India tightened and bounties were placed on tiger’s heads, a tigress was shot in the mouth by a poacher. Injured but alive, it turned from its usual hunting habits to easier prey—humans. For the next seven years, this man-made killer terrified locals, growing bolder with every kill. Colonial authorities, desperate for help, finally called upon Jim Corbett, a then-unknown railroad employee of humble origins who had grown up hunting game through the hills of Kumaon. “That when it comes to truly behaving as a beast — to killing wantonly and without reason — it is our kind, not theirs, that is the fiercer of the two.”I won this book through a giveaway in exchange for an honest review....Technically, I won a different book, but the publisher had some issue and wasn’t able to send out the books to the giveaway winners, but didn’t want to leave them empty handed, so instead sent this book. This was a wonderfully written nonfiction book about the Champawat Tiger! “That when it comes to truly behaving as a beast — to killing wantonly and without reason — it is our kind, not theirs, that is the fiercer of the two.”I won this book through a giveaway in exchange for an honest review....Technically, I won a different book, but the publisher had some issue and wasn’t able to send out the books to the giveaway winners, but didn’t want to leave them empty handed, so instead sent this book. This was a wonderfully written nonfiction book about the Champawat Tiger! Honestly, I didn’t actually think I would finish it. I figured I would just kind of skim it....However, that was not the case! I actually really enjoyed it. Not to mention, I learned quite a bit too - which is always a great feeling after reading a book! Written in an engaging style, this is primarily an extended journalistic piece on the life and times of the Champawat tigress. Incorporating a wide ranging investigation into the history of the area, the book considers how and why this particular tiger turned man-eater, while attempting to explain the wider pattern of tiger attacks right up to the present day. It's clear that the research is both detailed and extensive, but the language and style often veer towards sensationalism, especially dur Written in an engaging style, this is primarily an extended journalistic piece on the life and times of the Champawat tigress. Incorporating a wide ranging investigation into the history of the area, the book considers how and why this particular tiger turned man-eater, while attempting to explain the wider pattern of tiger attacks right up to the present day. It's clear that the research is both detailed and extensive, but the language and style often veer towards sensationalism, especially during imagined and reported scenes of predation. What saves the book is author's refusal to turn the tiger into a monster. Her story is one of limited choices: injury, degradation of habitat, loss of prey. A 'man-made disaster'. There's a sadness to it all, for those affected by desperate tigers and for the animals themselves, pressed into ever closer contact with humans. It's notable that the man who finally killed the Champawat tiger, Jim Corbett, on whose memoir this book is based, became a leading name in tiger conservation, playing a significant role in establishing the first Indian National park, which was named after him. The slight protection offered by such parks is welcome but tigers are still threatened by poachers and the ceaseless human need for more space. The negative impact of such human population growth and expansion, especially into lands previously occupied by such predators, is obvious and remains problematic, with tiger extinction an increasingly likely outcome. In explaining this process, and the resulting human/tiger conflict, in terms of human habitation, colonialism, and ecological mismanagement, rather than any innate predatory desire for human flesh, the book aims primarily for understanding, of our own failures and the ways in which they might affect the world we share. That the author strays into creative embellishment for the sake of a good story might well affect the reading, but hopefully the book will inspire people to find out more about how we can work towards a more effective means of coexistence with these beautiful/deadly animals before they are gone forever. ARC via Netgalley. A fascinating history of a man-eating tiger and the wider history of how humans encroaching on tiger territory lead to this tragedy with 436 dead humans and one dead tiger. This was a really interesting history book that looked into the history of tigers generally, why this tiger became a problem, how the villagers responded, how the colonial authorities responded and how attitudes towards tigers changed over time. I found this an eye-opening book giving all sides of the story. DNF'd 35%. This just isn't doing anything for me. The author presents a lot of scenarios in a play by play manor, even telling what people are thinking and then at the end will say roughly "I'm guessing something like this happened at some point". Very frustrating to read! The writing was also not engaging. Maybe I'll revisit this interesting topic from another author in the future but I wont be picking this back up. I only know a slight bit of information about the Champawat Tiger. Therefore, I found this book to be very interesting to learn about animals from other countries. To be honest, when I think of "deadly" animals; the Champawat Tiger is not one that makes the top ten list. However, after reading this book it is right up in the top animals of the world. This is no joke as the Champawat Tiger held four hundred and thirty six kills before Jim Corbett killed him. Although, reading this book, I can ima I only know a slight bit of information about the Champawat Tiger. Therefore, I found this book to be very interesting to learn about animals from other countries. To be honest, when I think of "deadly" animals; the Champawat Tiger is not one that makes the top ten list. However, after reading this book it is right up in the top animals of the world. This is no joke as the Champawat Tiger held four hundred and thirty six kills before Jim Corbett killed him. Although, reading this book, I can imagine in those moments when Jim killed the Champawat Tiger that it was with some remorse and respect for the beast. Mr. Huckelbridge writes as a good storyteller. He provided plenty of details without allowing the book to be bogged down with details. Also, it felt as if I was transported back in time and stepped into Jim's shoes as he hunted the Champawat Tiger. Anyone who likes to read nonfiction books, should pick up a copy of this book. The narrator ruined the book for me , sounded like a 50’s late night tv ad pitch , eventually a few chapters in he could not keep up the inane voice. . Over emoted, over articulated. Eventually the narrator could not keep the inane voice up , and became more natural, still not great, but tolerable. The STORY itself was much better, told with respect . I love tigers. I think they are among one of the most majestic beasts on this planet, and it tears me apart that people continue to hunt them to the point of extinction. Between the cover and the title, there was no doubt I was going to pass on the opportunity to read about the Champawat tiger to find out what made her so deadly. Dane Huckelbridge and No Beast So Fierce does not disappoint.You would think that a story about man-eating tigers would change my mind about these fearsome beasts. Inst I love tigers. I think they are among one of the most majestic beasts on this planet, and it tears me apart that people continue to hunt them to the point of extinction. Between the cover and the title, there was no doubt I was going to pass on the opportunity to read about the Champawat tiger to find out what made her so deadly. Dane Huckelbridge and No Beast So Fierce does not disappoint.You would think that a story about man-eating tigers would change my mind about these fearsome beasts. Instead, I have even more compassion for these misunderstood animals. I say misunderstood because I feel that people view tigers or any animals that eat humans as vicious and vengeful. Mr. Huckelbridge shows, however, that in the case of man-eating tigers in India at least, the reasons why animals become man-eaters are often, if not entirely, the fault of humans. We are the ones encroaching on their territory. We are the ones changing their natural habitat. Because of our actions, we are the ones forcing them to compete with each other for a dwindling supply of food. With competition comes injury. With injury comes desperation. A desperate animal will do anything to survive, even if it means roaming far from home to find a more accessible, more attainable food source.The fact that I feel for these animals and the hardships humans have wrought on them does not mean I ever want to meet one in the open. Mr. Huckelbridge does not ignore any of a tiger’s weapons and makes sure readers understand how they hunt and how they kill. The pictures he paints and the facts he records are gruesome. They make a horror film seem tame by comparison. For all the gore though, Mr. Huckelbridge maintains his sense of reverence for these animals, no matter how many humans one killed, because he understands, and he makes sure readers understand, that for an injured, starving animal, discovering how easy it is to hunt these odd, two-legged animals is the animal equivalent of humans inventing the wheel. If humans can and do resort to cannibalism in times of starvation, there should be no surprise when an equally hungry tiger will look at humans as nothing more than easy prey.The story Mr. Huckelbridge tells is not just one of a tiger adapting its hunting to eat humans. It is also a story of the geopolitical conflicts arising during the Victorian era in northern India. It is another story highlighting the arrogance of the British colonials and the negative impact British occupation had on all aspects of native life, including but not limited to weapon ownership, hunting, agriculture, cultural rites, and respect for nature. Mr. Huckelbridge navigates readers through the sociological, economic, and political conflicts occurring before, during, and after the Champawat tiger’s reign of terror to help us understand how such a thing could happen and why it keeps happening.What No Beast So Fierce becomes is a conservation novel in the guise of a historical horror novel. In understanding the hows and whys of tigers becoming man-eaters, it allows readers to know how we can save these beasts and the reasons why we should. The knowledge does not remove the numerous weapons available to tigers while hunting, but it does make them a bit less terrifying. If knowledge is power, then Mr. Huckelbridge and No Beast So Fierce is a powerful weapon in the fight against extinction. 3.5Wasn't quite sure what to expect going into No Beast So Fierce, but I certainly didn't come away disappointed. Huckelbridge clearly thoroughly researched the subject matter before committing pen to paper, and she writes in an informative as well as engaging style.I feel what could have easily turned into a much more sensationalistic colonial adventure story under another author was handled with a lot more care and balance than I expected given the content matter. The book does have a distinct 3.5Wasn't quite sure what to expect going into No Beast So Fierce, but I certainly didn't come away disappointed. Huckelbridge clearly thoroughly researched the subject matter before committing pen to paper, and she writes in an informative as well as engaging style.I feel what could have easily turned into a much more sensationalistic colonial adventure story under another author was handled with a lot more care and balance than I expected given the content matter. The book does have a distinctive melancholy feel throughout and offers no solutions to man's never-ending expansion and the tiger's continuing loss of habitat.Overall though, I found it an educational and worthwhile read. With thanks to Harpercollins and Netgalley for the arc in exchange for an honest review. Of course i was going to like this book; natural history, colonial history, ecology and a man eating Bengal tiger claimed to have killed 436 people at the start of the 20th century.Huckelbridge did an outstanding job telling and researching this story. A story like this is not just a story about a tiger attacking humans. Changing habitats, political and societal changes it all is part of the Champawat Tiger story. The story of Jim Corbett’s hunt of the Champawat man-eater was reasonably interesting - it just took almost half the book to get there, through long detours about Nepalese and Indian history framed by tigers. I might go read Corbett’s memoirs, but I really can’t recommend Huckelbridge’s account. I found myself bored a lot, the style is melodramatic too often, and the author’s frequent conjectures and assumptions about what Corbett must have been feeling or thinking were annoying. I had high hope The story of Jim Corbett’s hunt of the Champawat man-eater was reasonably interesting - it just took almost half the book to get there, through long detours about Nepalese and Indian history framed by tigers. I might go read Corbett’s memoirs, but I really can’t recommend Huckelbridge’s account. I found myself bored a lot, the style is melodramatic too often, and the author’s frequent conjectures and assumptions about what Corbett must have been feeling or thinking were annoying. I had high hopes, but the book didn’t deliver. Had high hopes for this book about the deadliest animal in history but was left disappointed by a poor structure to the book. Most of the story is not about the tiger, the author repeats himself throughout the book and uses language that no-one uses. The book has some good material. I have read about James Corbett in the past and have read short accounts of the Champawat tiger, the Lions of Tsavo and some of the other cats mentioned in this book. The parts of the book dealing with the hunt for the cat were a bit short and a bit disappointing. The background information about the history of Nepal and northeastern India was well written and interesting as was the background information on the British occupation of India. The information on the The book has some good material. I have read about James Corbett in the past and have read short accounts of the Champawat tiger, the Lions of Tsavo and some of the other cats mentioned in this book. The parts of the book dealing with the hunt for the cat were a bit short and a bit disappointing. The background information about the history of Nepal and northeastern India was well written and interesting as was the background information on the British occupation of India. The information on the reasons behind the cat's deadly killings was compelling. If you are interested in Nepal, India, James Corbett or the impact of changing environments on apex predators, this book has some very good information. If you are looking for a good, action packed story of man versus beast, it falls short but is still a decent read. This is the gripping true story of the Champawat tiger that likely killed over 400 people in Nepal and India in the early 1900's, and the legendary hunter, Jim Corbett, who finally killed him. The writer creates a thrilling nonfiction account that viscerally describes the animal and their attack mode as well as methodically explaining the natural and man-made forces that contributed to the creation of the man-eater. The book finishes with the thrilling final hunt. I received this free in place o This is the gripping true story of the Champawat tiger that likely killed over 400 people in Nepal and India in the early 1900's, and the legendary hunter, Jim Corbett, who finally killed him. The writer creates a thrilling nonfiction account that viscerally describes the animal and their attack mode as well as methodically explaining the natural and man-made forces that contributed to the creation of the man-eater. The book finishes with the thrilling final hunt. I received this free in place of another goodreads win and I am happy I did. I bought No Beast So Fierce and was really excited to read it, remembering how much my little brother had loved reading The Ghost and The Darkness. It was one of the only books he read as a child and we watched the movie so so many times.This book is interesting and well written but I think I expected it to be more directly about the hunt itself. The first two thirds of the book covered a history of colonial India, war and politics, a view of the contributing factors relating to tigers turning t I bought No Beast So Fierce and was really excited to read it, remembering how much my little brother had loved reading The Ghost and The Darkness. It was one of the only books he read as a child and we watched the movie so so many times.This book is interesting and well written but I think I expected it to be more directly about the hunt itself. The first two thirds of the book covered a history of colonial India, war and politics, a view of the contributing factors relating to tigers turning to humans as food and a history of Jim Corbett. This was all interesting but not entirely what I was looking for in this book.However, the final third of the book, detailing the hunt itself, was fantastic. The writing is vivid and clean. The hunt is terrifying and exhilarating and the stories of the bravery of the men involved (particularly that of the village residents and leaders who had seen their family members slaughtered by a seemingly unstoppable monster) made for a pretty excellent read.I would recommend this to anyone with an interest in Colonial India, hunting, the conservation efforts of India and Jim Corbett or stories of animals fighting to preserve their existence. I won this book in the first reads giveaway. 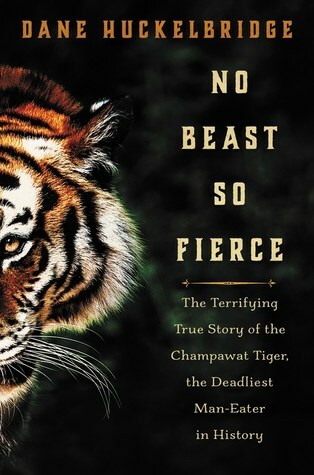 I was enthralled and shocked by this terrifying, but true tale of the Champawat Tiger. Well written and entertaining, I thoroughly enjoyed this story. I did not like this, but I will attempt to explain what I didn't like about it, so that you can make your own informed decision. TLDR: How could a story about something so cool be so boring? ?I think this was attempting to go for something along the lines of The Lost City of the Monkey God, a mix of narrative nonfiction paired with broader context in terms of the regional geography and history. It didn't really achieve that, in part owing to a somewhat too holistic approach. His research was obvi I did not like this, but I will attempt to explain what I didn't like about it, so that you can make your own informed decision. TLDR: How could a story about something so cool be so boring? ?I think this was attempting to go for something along the lines of The Lost City of the Monkey God, a mix of narrative nonfiction paired with broader context in terms of the regional geography and history. It didn't really achieve that, in part owing to a somewhat too holistic approach. His research was obviously very thorough, but it often felt like he included everything he found, rather than just the information that was most pertinent to the story at hand. For example, around two-thirds of the way through the book, the reader is provided with in-depth biographies of Jim Corbett's grandparents and parents. Sure, they lived interesting lives, but is the amount of page-space they were given proportionate to their relevance to the story at hand? I would argue no. I appreciated that he told the story of the man-eating tiger within the context of the changes to the political leadership of the area and the way policy changes affected the tiger's habitat. However, much of the big points of that (banning indigenous people from the forests disrupted the delicate ecosystem balance they had forged, pushing for increased agriculture for monetary output decreased the tiger's hunting grounds and brought them into closer contact with people, etc) are repeated endlessly. I'm not sure there was a single tiger attack that has ever occurred world-wide that was not brought up in this book. Similarly, the physical abilities of the Bengal tiger are brought up again and again and again. It became tedious wading through long sections about the specific histories of regions with British-ruled India and then having to go over once again just how deadly this man-eating tiger was. Finally, one of my biggest gripes with this book was the writing style. It was definitely written by a journalist, and one who couldn't quite decide how he wanted to sound. At times the book is dry and didactic (one of the most over-used words in the book is 'elide') and at other times it is insultingly casual. I'm not sure who he thought his audience was, and I'm not sure he knew to be honest. The tone is just confusing. On top of that there is an absolutely horrific overuse of statements like "he would have...", "he must have been aware of...", "we can assume that..." "Jim would have known...", "one has to assume that Corbett was well aware...". If you don't know, don't guess. These crutch phrases are used to such a great extent that it became almost laughable. These statements are totally unnecessary and truly irritating. It underscored how much Huckelbridge wanted to write a narrative nonfiction book and how he just didn't have enough information to do that properly. Sure he had tons of information about the history of India as a British colony, and about what brings tigers to eat people, but when it came to the actual story events of Jim Corbett tracking and hunting the Champawat tiger, all he had to go on were Corbett's own memoirs. His constant attempts to fill in the gaps come across as clumsy. In addition to his crutch phrases, he also includes many long extracts from primary documents. In theory, this sounds like a good idea, but when you have more than one multi-paragraph extract per chapter it gets old quick. In short, Huckelbridge found an interesting story, but it's executed so poorly that I can't honestly recommend it to anyone. A story of man vs. nature that is so much more than you might think. But first: Now I really want to pet a (living) tiger. I want to dig my fingers into that chest floof and squeeze. I want to scratch those big striped muttonchops. I want to rest my head on a tiger tummy. I want to wiggle those whiskers. I know it's never a good idea to just go around touching wild animals, especially ones (as the book shows) that can kill people hiding in trees, fishing from boats, or just chilling at home in t A story of man vs. nature that is so much more than you might think. But first: Now I really want to pet a (living) tiger. I want to dig my fingers into that chest floof and squeeze. I want to scratch those big striped muttonchops. I want to rest my head on a tiger tummy. I want to wiggle those whiskers. I know it's never a good idea to just go around touching wild animals, especially ones (as the book shows) that can kill people hiding in trees, fishing from boats, or just chilling at home in their huts. But look at that picture on the cover and photo at the end of the picture plates and tell me you don't want to do the same. So back to the book: Of course, there's an old-fashioned adventure yarn about a terrifying beast stalking villagers and the man tasked with stopping it. But there's also lots of information about Bengal Tigers, their habits, habitats, and stories of their power. There's information about the social and environmental upheaval that was happening in India at the time. There's the idea that this event was one more sign of a changing world that be near unrecognizable by the century's end. It's going to be hard not to compare this one to The Tiger: A True Story of Vengeance and SurvivalThe Tiger: A True Story of Vengeance and Survival, because they're just so similar. A tiger (wounded by man, it's habitat and food options shrinking) becomes a man eater, someone is tasked with stopping it, we learn about the complex social and environmental factors in a changing world that led to the creation (not birth--they're never born) of a man-eater. Of the two, I think I would have to give the slight edge to The Tiger, simply because the episode happened more recently, and was better documented. It happened in the 90s; John Vaillant could simply interview people who were there. Meanwhile, Dane Huckelbridge is writing about something that happened over 100 years ago, in a region that had spotty record-keeping to begin with. He resorts to the habit I dislike in nonfiction books where he talks about how people must have felt or what they might have seen. When excellent writing is combined with a favorite subject matter it results in a near perfect score. I say 'near' because I overlooked the few minor faults that did not detract from my enjoyment of this book. Huckelbridge gives a detailed account of not just the actual hunting of the tiger and it's exploits, but a comprehensive overview of the history of the region, from the terai grasslands to the Himalayan foothills that comprise the lands bordering western Nepal and northern India. The milit When excellent writing is combined with a favorite subject matter it results in a near perfect score. I say 'near' because I overlooked the few minor faults that did not detract from my enjoyment of this book. Huckelbridge gives a detailed account of not just the actual hunting of the tiger and it's exploits, but a comprehensive overview of the history of the region, from the terai grasslands to the Himalayan foothills that comprise the lands bordering western Nepal and northern India. The military, political and environmental backdrop is told in an engaging way, never going into too much detail to bore the lay person, but all important in helping to understand the context in which rampant man-eating by tigers and leopards arose. Yes, one can simply read Jim Corbett's books for the thrills and adventure direct from the horse's mouth, but I learnt a great deal more from this work, of how the British started the process of emphasizing economic production of export crops and timber over the sustainable lifestyles of the country's original inhabitants, in so doing converting swathes of forests into farms and imposing a system of wage labor over subsistence living. How after the Mutiny of 1857 access to weapons of all sorts, not just firearms, were severely curtailed, resulting in villagers becoming totally defenseless against the ravages of wild animals. Of course most man-eaters were driven to the practice due to injuries, again primarily caused by inexperienced 'sport' shooters whose numbers increased with British rule, but these broader negative factors were also at play in aggravating the situation. There is a bibliography section with some helpful references, but the book could have had more detailed notes to guide those who wish to pursue further independent research. The word 'colonist' was also used repeatedly when I suppose the author meant 'colonialist', since the British never really set up colonies of immigrants as they did in Australia or North America, but imposed colonial rule over the locals. However as mentioned these are but minor faults and the book remains a very fascinating study of a specific place and time. Oh and there was also the obligatory coverage of tiger biology and ecology, albeit sometimes in an overly sensationalist style.. I picked this book off the NEW shelf because I had read the John Valiant 2010 book on the Champeska (spelling? Eastern Siberian wilderness) man-killer and really liked how he situated his story in the culture and history and ecology of that area. DH's book is similar, in that DH analyzes why the tiger is such a great predator of animals (and hence of man if forced to it), what the culture of this part of India was like at the turn of the 1900s, and why Jim Corbett, at that point basically a hunt I picked this book off the NEW shelf because I had read the John Valiant 2010 book on the Champeska (spelling? Eastern Siberian wilderness) man-killer and really liked how he situated his story in the culture and history and ecology of that area. DH's book is similar, in that DH analyzes why the tiger is such a great predator of animals (and hence of man if forced to it), what the culture of this part of India was like at the turn of the 1900s, and why Jim Corbett, at that point basically a hunter of rabbits, was able to kill this animal when professional British hunters were unable to. DH begins with a vivid imagining of how the Champawat tiger became so badly injured that her only recourse was to prey on the natives of that region.As the actual killing of the tigress takes a very short time (though it may have seemed long to Corbett! ), the story could have been over in perhaps 5 paragraphs. One might even say that though the killing was certainly important to the inhabitants of the area, and to Corbett and his future career and ultimately to the creation of the wildlife sanctuary for tigers etc. that bears his name, it took place a long time ago and so why should it be necessary to write about it? It could make, of course, a thrilling movie but as an account....?However, DH situates the slaying within a particular historical period of India, one that in retrospect was pivotal in terms of politics, conservation, and economic development. What happened after the killing of the tiger is important too, and to understand that, and the subsequent social changes of India this episode can give some enlightenment. Little (so to speak) things can illuminate larger things.I found all of the book interesting and certainly have come away with a better understanding of the tiger's ability to hunt, track, kill and escape. Bengal tigers do not normally attack people. Yet in the early 20th century, natives who lived in the foothills of the Himalayan Mountains were being attacked and eaten by a tiger-turned-killer they called Champawat. This is her story, and an amazing story it is. Over the course of several years, Champawat is believed to have killed 436 people. Jim Corbett, a British postal worker, hunter, tracker, and conservationist who had lived and worked in India all his life, was called in to dispatch the Bengal tigers do not normally attack people. Yet in the early 20th century, natives who lived in the foothills of the Himalayan Mountains were being attacked and eaten by a tiger-turned-killer they called Champawat. This is her story, and an amazing story it is. Over the course of several years, Champawat is believed to have killed 436 people. Jim Corbett, a British postal worker, hunter, tracker, and conservationist who had lived and worked in India all his life, was called in to dispatch the tiger. Corbett’s book, “Man-Eaters of Kumaon,” published in 1944, gives a first-hand account of how he was able to track and kill the cat. Huckelbridge’s book takes a wider view: why would a normally shy tiger, an animal that avoids encounters with humans, turn into a man-killer? Why were the local people unable to deal with the threat? What impact did the British conquest and its attempts to control the Indian population have on this tragedy? Huckelbridge enumerates factors that can turn a tiger into a man-eater: “a disabling wound or infirmity, a loss of prey species, or a degradation of natural habitat.” In the case of Champawat, all three of these factors were present. When the animal lay dead on the forest floor, and the old wounds she had suffered were apparent, one has to wonder if the bengal tiger is really the apex predator. Or is it mankind. 2.5 stars. The story of the Champawat tiger is fascinating, but stretching it to book length required a considerable amount of speculation and repetition. Many sections of the narrative are prefaced with "it is not difficult to imagine that...", or "Corbett might have...", or other indicators that what follows is largely educated conjecture -- highly entertaining conjecture presented in a very readable (if often somewhat overwrought and melodramatic) style, but conjecture nonetheless. And while 2.5 stars. The story of the Champawat tiger is fascinating, but stretching it to book length required a considerable amount of speculation and repetition. Many sections of the narrative are prefaced with "it is not difficult to imagine that...", or "Corbett might have...", or other indicators that what follows is largely educated conjecture -- highly entertaining conjecture presented in a very readable (if often somewhat overwrought and melodramatic) style, but conjecture nonetheless. And while there is a great deal of factual information here, much of it is presented over and over again -- I lost track of how many times it was mentioned that an adult Bengal tiger can reach speeds of up to 40 miles per hour over short distances. This is a terrific longform article, buried in a full-length book. This book should be called "The story of the guy who killed a bunch of animals and got praised for it." Seriously though, maybe half of this book was actually about a tiger! I understand the extra information about Hinduism and about the guy who ultimately killed the tiger this book was supposed to be about. This book really didn't touch on the man-eating tiger but for a moment at the beginning and then finally the last few chapters. I don't mean to be so harsh, but really this book was a failur This book should be called "The story of the guy who killed a bunch of animals and got praised for it." Seriously though, maybe half of this book was actually about a tiger! I understand the extra information about Hinduism and about the guy who ultimately killed the tiger this book was supposed to be about. This book really didn't touch on the man-eating tiger but for a moment at the beginning and then finally the last few chapters. I don't mean to be so harsh, but really this book was a failure! The Champawat man-eater was supposed to have killed over 430 men, women and children in border land between India and Nepal in the early years of the 20th Century. In this book Huckelbridge looks at the tiger as an example of an apex predator and examines why tigers turn from killing their normal prey into attacking humans. The book then describes the hunt for the Champawat tiger and the aftermath of her death, a killing in which the hunter becomes a passionate environmentalist. Covering ideas a The Champawat man-eater was supposed to have killed over 430 men, women and children in border land between India and Nepal in the early years of the 20th Century. In this book Huckelbridge looks at the tiger as an example of an apex predator and examines why tigers turn from killing their normal prey into attacking humans. The book then describes the hunt for the Champawat tiger and the aftermath of her death, a killing in which the hunter becomes a passionate environmentalist. Covering ideas about colonialism, biology, ecology and society in India, this is a fascinating read.